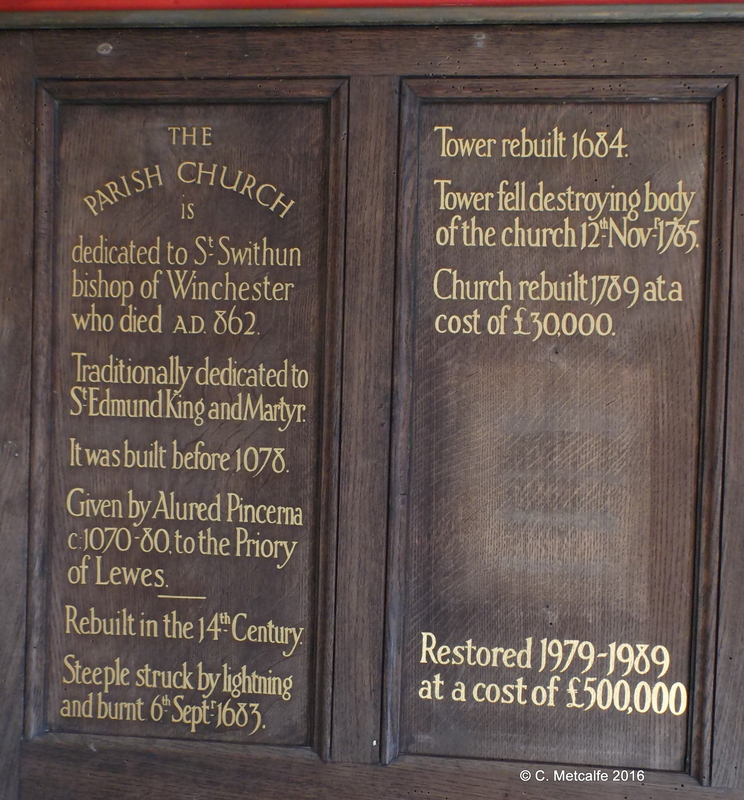 Following the fall of the tower of St Swithun’s church, on 12 November 1785, some church walls had to be pulled down. Some of the present pillars and capitals were preserved and are considered very fine examples of the late Perpendicular style. An Act of Parliament was passed in 1787 for the rebuilding of this church. The date 1789 is engraved in a stone over the west door of the church. 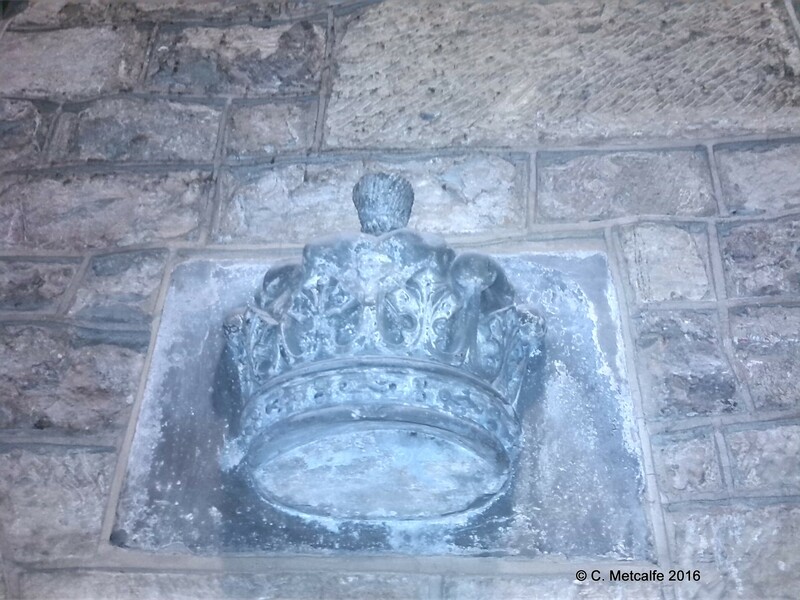 In the tower belfry, the date 1813 is carved. 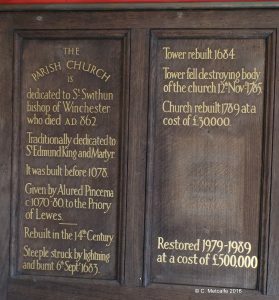 The cost of rebuilding was about £30,000. This was partly met by a ‘Brief’, which recommended collections in churches throughout the land for parishes in distress. A brief for the sum of £4,000 for East Grinstead was issued in 1786. The funds did not stretch to seating in the church, nor to completion of the roof. A flat plaster roof was put up, and rushes were strewn over the paving. The congregation brought their own chairs until 1806. Briefs ceased in 1827. The Act abolishing compulsory Church Rates was passed in 1868, but in East Grinstead, Church Rates were still collected for another 7 years in order to pay off loans for the rebuilding. ‘This did not improve relations between Church and Town‘, according to GM Smart, who wrote A Guide to East Grinstead Parish Church in 1975. The church was designed by James Wyatt, architect (1746-1813). The stone was quarried nearby at Selsfield, Blackwell and Wych Cross. After the death of Wyatt, the tower was designed by J.T Groves and the building was supervised by the brothers Inwood. There is a story that Mr Speaker Abbot, who lived in Forest Row at Kidbrooke, required the tower to be 25 feet higher than the old one, so that he could see the weather vane from his house. (Forest Row was part of the parish of St Swithun’s at this time). The last 25 feet proved to be very expensive. Mr Abbot bought Kidbrooke in 1805. He apparently wrote to the Home Secretary asking for the bodies of highwaymen, which were publicly displayed, to be removed before his wife travelled into town (in a horse and carriage, of course). The original design for the church was never completed: there were meant to be pinnacles on the side buttresses, too. The finished church, on its hilltop site, was an imposing battlemented building in the Perpendicular style. Clerestory windows were inset, but probably had plain glass at this time. The clock was described as being 8 feet in diameter with 13 inch long hour figures and dots of 1¾ inches. In 1836, a pinnacle was blown down in a gale. It fell through the church roof into the vicarage pew. Another pinnacle fell in 1928. In 1868, J.C Stenning was very critical of the appearance of this church in an article, describing it as ‘somewhat poor in architectural detail‘. He noted that there was a nave, with 2 aisles, but no transept, and that the chancel was ‘small and meagre in comparison with the body of the building‘. The walls and ceilings were whitewashed, and there was ‘no stained glass‘. The windows of the south and north doors had ‘some diagonal pattern of a bad blue and dingy yellow‘ painted ‘in very questionable taste’. He concluded ‘This church had the misfortune to be built when ecclesiastical architecture was at its lowest point’. There were pews in the nave with the names of farms and houses whose residents sat there. Those pews were replaced in the next phase of the development of the church, in the 1870s. Fortunately for us, since 1868, generous patrons have given the beautiful stained glass windows which embellish the church today. 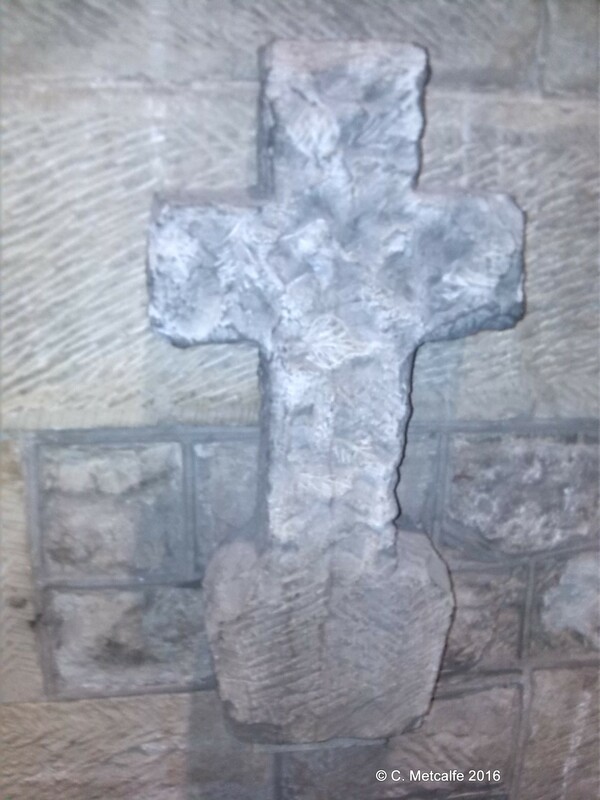 Two fragmen ts of the old church survive- a cross, and a Ducal crown (possibly for the Sackvilles, who were Dukes of Dorset for 5 generations and who held the gift of the living of this parish after 1554).